Caravan believes that for a professional organization that is involved in an outdoors event, it is very important that they possess all of the right tools to make sure everything goes off properly and easily. With the Displayshade 8 foot by 8 foot Canopy with Professional Top, you have what it takes to create a booth for your event that will keep you, your literature, and all of your products safe so that you can have the most successful event possible. The frame is a lightweight steel. Can you please tell me what the head clearance is at edge of the canopy? It has a 7 foot head clearance. Does this canopy include a roller bag for storage? I apologize, but it does not come with a roller bag. However, sometimes it does come with a slip cover. 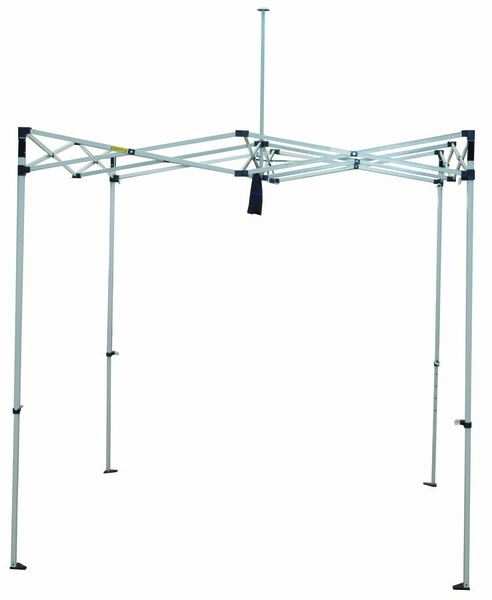 Will this canopy work with your 8' x 8' sidewalls? Thank you. This will only work with our Caravan brand 8' x 8' sidewalls. Can I add a logo on each of the four panels in white on this blue top Caravan Displayshade canopy? Yes, we can. You can fill out the form at the following link and upload your logo for a free quote: Canopy Custom Graphics Quote Form Our Graphics Department must actually see your logo as well as the placements you require the logo before they can provide you with a quote. Our local Fire Marshall requires a certificate stating that canopies are fire-retardant. 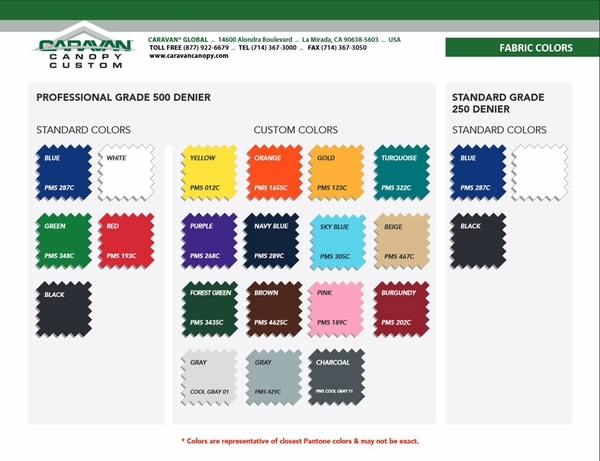 Does this Caravan Displayshade canopy have this certification? Also, is it possible to purchase side walls for it? Yes, this item is CPAI-84 Flame Certified and NFPA-701 Flame Certified. You can also purchase sidewalls for the canopy. They are available under the "accessories" tab of the item's page. Is it possible to order one of these canopies with custom graphics printed on it and a roller bag? We can do that. You can fill out the form at the following link and upload your logo for a free quote: Canopy Custom Graphics Quote Form Our Custom Graphics department must have your logo in JPG format in order to generate a quote. Is the canopy water proof or water resistant ? They are great. We have a number of them for our farmers markets and they hold up well - water resistant and water proof. Are the legs commercial steel or lightweight steel? This model has lightweight steel legs. What is the size and the diameter of the legs for this canopy? This canopy is 8 x 8. The leg diameter is 1-1/8". Are the legs of this canopy steel or aluminum? The legs on this canopy are steel. Can you tell me the height of the valance? (Printable area). Also the height from bottom of valance to ground? 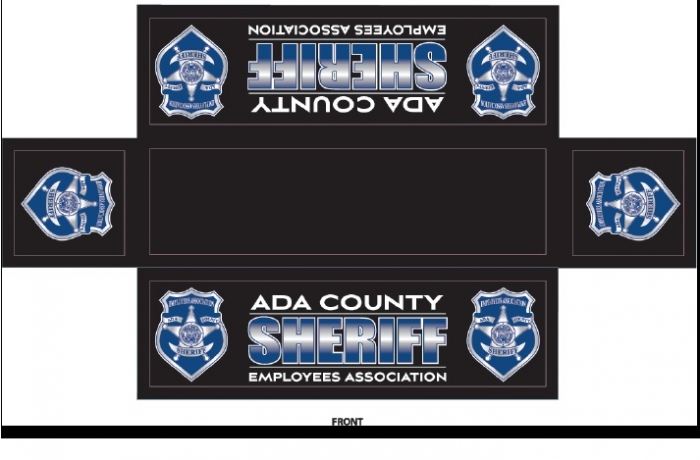 The valance is approximately 13" tall and the printable area is 10". At the highest setting, the height from the bottom of the valance to the ground is 7'. If you are interested in adding custom graphics to this canopy, please see our Canopy Custom Graphics Form for a free quote and rendering. Live in Missouri where it gets high wind. Have had the cheaper Canopy blow apart by the wind. 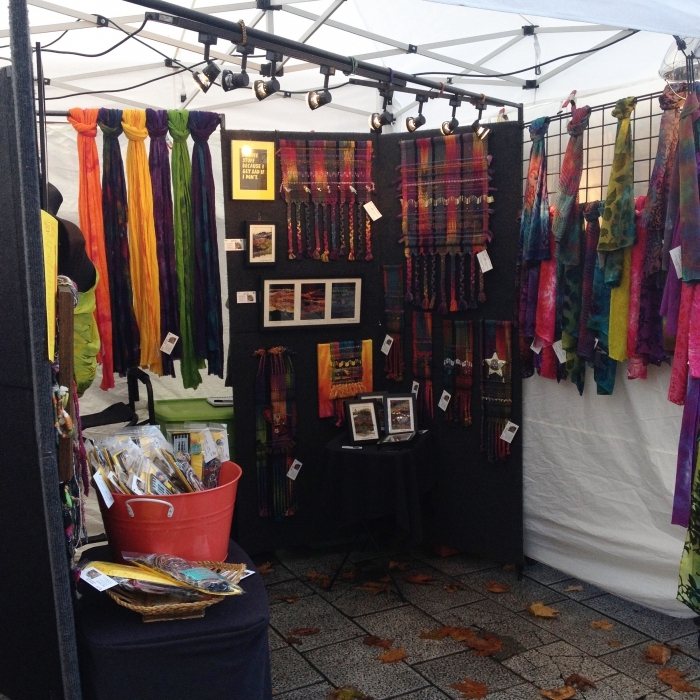 So I was thrilled that I spent a little more and have a stronger canopy. We bought it with one side wall. We use it as both a "garage" to keep our little camper under at home, and we use is as cover/shade to extend our camper outside space when camping. Since our camper is a teardrop, the kitchen part is outside. 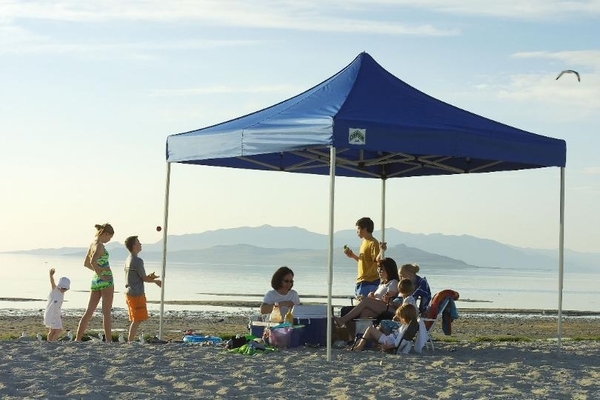 We used this canopy plus one wall for a week camping and it was very sturdy and great in the rain (the one wall really helped). It is of excellent quality, easy to take up/down, and easily fits in our small SUV. It arrived on time, no instructions but simple enough to figure out in a few minutes. I needed a friend to help me put it up the first time but as my fish market man told me from now on I should be able to take down and put up by myself from now on. It gives me great shade on my patio and I hope to leave it up in winter for my morning cup of tea. Everyone I talked to were very helpful. Great canopy! Very sturdy and solid but not too heavy to easily handle by a not-so-strong woman, ME! Easy set up and tear down. I definitely recommend this fab canopy! 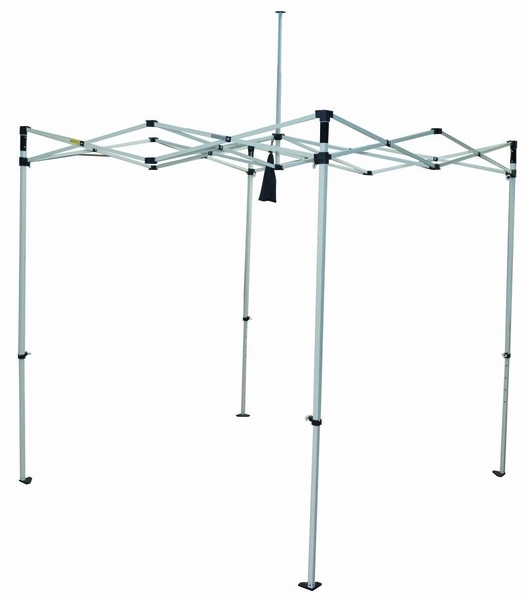 Easy to put up very durable. Looks good and serves the purpose we bought it for. ProsEverything. Mostly the ease it which it went up. Excellent canopy. The canopy is first-rate. It puts up easily and provides a good venue for my business. The product was delivered on time and was exactly as advertised.